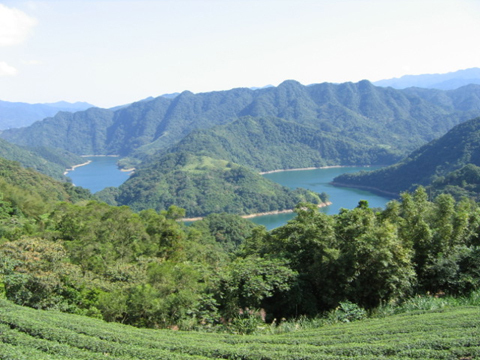 On Oct 19th, Friday, Wenyuan couple drove me and Shan-wei and Mr. Huang Hui-jing to Pinlin mountain area. This Qiu An Qinpu's (Autumn Hut Qin Book 秋庵琴譜) owner is Mr. Huang Hui-jing 黃懷瑾 in Taoyuan Taiwan. 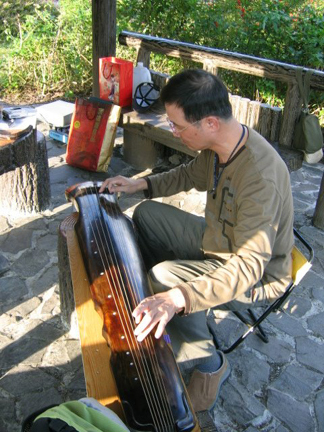 Mr. Huang is a retired captain and learned Guqin from Master Rong Tian-qi 容天祈*1 about 30 something years ago. 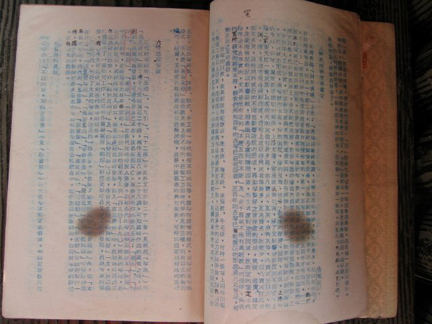 Master Rong gave him this qin book where Rong had collected all the pieces he played and he liked, and had his wife print out for Mr. Huang in 1974. Master Rong gave the name "Qiu An" (Autumn Hut) as he had an antique qin called "Qiu Yue"*2 (Autumn Moon 秋月). 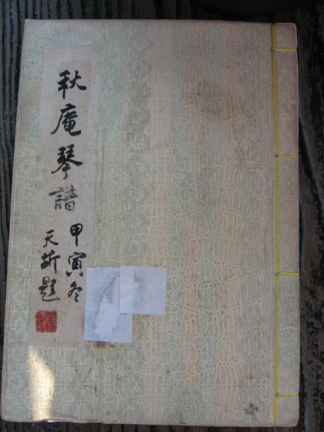 Master Rong made the cover by using wall paper with his calligraphy of the book's name and Mr. Huang bundled all the pages with covers and sewed them together. Qiu An Qinpu was never published to public. The first qin piece in this qinpu is Yu Lou Chun Xiao 玉樓春曉 (Jade Mansion Spring Dawn). Master Rong hand wrote a footnote at the end of Yu Lou Chun Xiao saying that "this piece was given by Master Wu Zong-hang 吳宗漢*3 personaly and is my favorite piece from Mei An Qinpu, as there is another story and reason related to this piece. 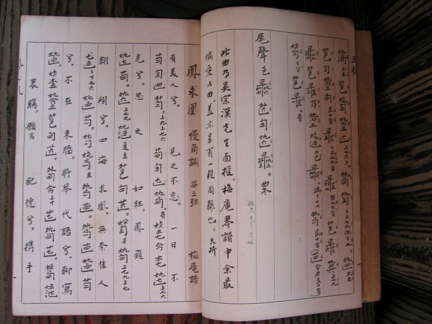 -- Tian-qi"
According to Mr. Huang, the story was that in 1962, Master Rong had just started learning qin. He saw a movie "Qian Nu You Hun" (倩女幽魂, the Enchanting Shadow) which was directed by Mr. Li Han-xiang 李翰祥. Master Rong was attracted by the qin music that Mr. Li used in this movie. Rong followed the movie's showing schedual from northern Taiwan to Southern Taiwan just to try to find out which qin piece that was. Finally in 1969, he found out that the qin piece was played by Master Wu Zong-hang and Wu was playing Yu Lou Chun Xiao from Mei An Qin Pu. On June 18th 1970, Master Rong met Master Wu couple at the First Seminar of Chinese Ancient Painting 第一屆中國古畫討論會. And later Master Wu gave Rong a copy of Mei An Qin Pu as a gift of Zhi Yin (friend who understand each other's music). Therefore Master Rong could never forget this story and this qin piece in his life. We stoped at a place near a small river with two pavilions. We stay in one pavilion. Wenyuan's husband was making tea for us. I played Mei Hua San Nong. Shan-wei played Xian Ong Cao 仙翁操. 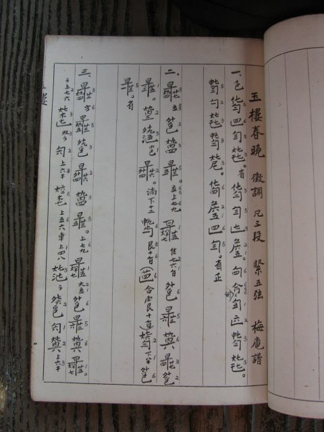 Below is the poem written by Mr. Huang (who is in the above picture) that he made this poem several days later to describe the scenery and Shan-wei's playing of the Xian Ong Cao. *1 Rong Tian-qi 容天祈 (1936-1994) was from Guandong province, and lived in Kaoxong, Taiwan. He studied poetry, literature, calligraphy and painting from age 8 with his grandfather. At age 17, he studied Chinese painting (mountain and water) with master Zhu Nian-ci 朱念慈 who was a pupil of Wu Chang-shuo 吳昌碩. At age 27, he studied guqin and Chinese painting with Master Hu Yin-tang 胡瑩堂. At age 36, he studied finger painting with Master Ma shou-hua 馬壽華. He died at age 58. *2 "Qiu Yue" once own by Zhou Lu-feng 周魯封 in Qin dynasty. *3 Wu Zong-hang 吳宗漢 (1903-?) was from Jiansu province and lived in the US. He was the 3rd generation of Mei An School. Master Wu learned qin from Master Xu Zhuo 徐卓 who was the lineal descent pupil of the Mei An School's establisher, Master Wang Yian-qing 王燕卿.